Some sizes are special order only and may not be listed online, in the event that you need a size not listed, please call 1-224-654-6500 for a sales representative. High-Speed PadsLow-Speed PadsBrush or Pad? 3100 - Aqua Burnishing Pad - For soft finishes. Proudcts a brilliant gloss. Exceptional durability and life. 3200 - TopLine Speed Burnish Pad - Best Gloss. Restore gloss to dull floors in a single pass. Optimizes ultra high speed floor care on a wide variety of floor finishes. Works best on floors with good base coat. Minimal finish removal. 3300 - Natural Blend Burnishing Pad - Best Gloss. Natural hair and synthetic fiber pad. Provides excellent results on a wide variety of floor finishes and traffic conditions. 3400 - Tan Burnishing Pad - Scuff and mark removal. For use on harder finishes or in high traffic areas. Produces brilliant "wet-look" gloss. Exceptional durability and life. Best for mark removal. 3500 - Natural Blend Tan Burnishing Pad - Natural hair and synthetic fiber pad designed for best mark removal. For use on harder finishes or in high traffic areas. Removes marks and scratches while it polishes. 3600 - Eraser™ Burnish Pad - Removes black marks in fewer passes than other pads and retains excellent gloss and image clarity. Excellent durability and minimal finish removal. 4100 - White Super Polishing Pad - For buffing very soft finishes or for polishing soft waxes on wood floors. Removes scuffs and black heel marks and enhances floor appearance. 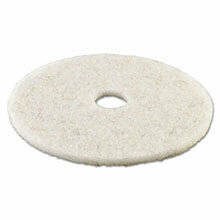 5000 - Topline Autoscrubber Pad - For light scrubbing of floors prior to burnishing. Excellent daily cleaning pad, minimal finish removal. Open construction resists clogging and allows for easy cleaning. Use on automatic floor machines. Best choice if followed by burnishing. 5100 - Red Buffing Pad - Specially designed for spray buffing. Cleans when damp; buffs when dry. Quickly cleans and removes scuff marks and enhances floor appearance. 5300 - Blue Cleaning Pad - For heavy duty scrubbing prior to recoating. Can also be used for heavy duty spray cleaning or foam scrubbing. Removes dirt, spills, and scuffs, leaving a clean surface ready for recoating. 7100 - Brown Stripping Pad - For wet or dry stripping. Prepares floors for recoating. Quickly and easily cuts through old finish. Conforms to uneven floors. 7200 - Black Stripper Pad - The industry standard against which all other stripping pads are compared. Maintains consistent high performance throughout the life of the pad. 7300 - High-Productivity Stripping Pad - Quickly and thoroughly removes old finish, dirt and buildup. Unique, open web construction - stripping solution flows through pad to rinse out dirt and reduce loading for increased pad-to-floor contact, more efficient stripping. Do you want a brush or a pad driver? If your preference is to have a dedicated product, select a brush. If you have a variety of applications, your choice may be a pad holder. The surface being cleaned and the amount of dirt build-up will help determine the selection. The key to remember when ordering these items is the block diameter in relationship to the machine size. A brush is sized 2 inches smaller than the machine because of the flare of the brush fibers. Pad drivers are specified 1 inch smaller than the machine. There is an easy way to cross check your selection from the Floor Machine Brushes and Clutch Plates section of this web site. A brush, long-trim pad driver, or short-trim pad driver without a riser, should be 2" smaller than the machine size. A pad driver should be 1" smaller than the machine size. This rule applies to over 90% of the applications. Floor Machine Brushes By Size 10" thru 21"
Pad, Bonnet, Sanding Drivers By Size 10" thru 22"